Is Laser Treatment Effective for Treating Acne? Acne is a common skin disorder that most people experience at some point in their lives. This problem is more common during puberty and teenage years. Teenagers and adults alike dread this skin condition as it spoils ones looks and causes distress. What’s even more frustrating is that acne leaves behind unsightly scarring and that is equally difficult to get rid of. Hormonal changes, unhealthy eating habits, stress, improper skincare and excess sebum production are amongst the main culprits for causing an acne outbreak. Some people are even more unfortunate because this wicked skin disorder accompanies them into their thirties and forties, long after the carefree teenage years have passed. In such cases, the usual home remedies and over-the-counter treatments don’t work effectively enough. Chronic acne and scar removal can only be accomplished with new age cosmetic procedures like laser treatment. This laser is considered to be the gold standard (topmost) treatment for acne, acne scars, stretch marks, photo-aged skin, and pigmentation on the face and body. The laser causes the production of new collagen, which fills the acne scars and generates newer, smoother skin. CO2 laser acne treatment is amongst the most sought after procedures and is widely used for treating acne and acne scars. Following treatment you will notice a visible improvement within a week. These results continue to improve over a period of time. This procedure aims at destroying the bacteria that are responsible for causing acne. However, treatment with this laser could cause mild side effects like dryness and redness on the skin. Pulsed light and heat therapy aims at destroying the acne causing bacteria and shrinking the sebaceous glands to reduce the production of sebum (oil) in the skin. But, this procedure could cause dryness and redness on the skin. 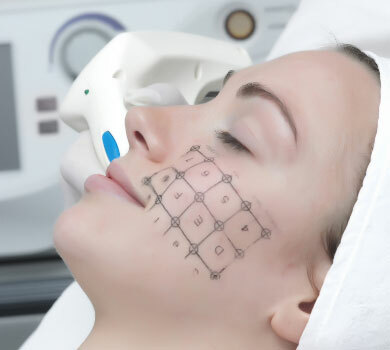 Why Decide on Laser Treatment? Laser acne treatment gives better results, particularly while treating persistent and inflammatory acne. Although oral drugs and topical creams prove to be effective, they can often cause dryness, skin irritation or other side effects. Also, it is difficult to treat acne on areas like the back and chest using topical creams. On the other hand, laser treatment does not cause any side effects or skin irritation. A major advantage is that it also proves to be effective in the reduction of scarring, which is left behind by severe acne. It is a quick, safe and effective procedure that provides clearer, healthier and acne-free skin. Dermatologists usually prescribe oral medications or topical creams to control acne, but they do not prove to be as efficient as laser treatment. Laser acne treatment is a safe and effective alternative that treats acne quickly and even helps in the removal of acne scars. For more information on this procedure, fix up an appointment with a specialist. Treatments > Is Laser Treatment Effective for Treating Acne?